If you smoke, you know better than anyone how a hard a habit it is to kick. If you want to quit, it helps to have a motivating reason—like lowering your risk for cancer, cardiovascular disease or similar conditions. Here’s another reason for quitting tobacco: it could be making your teeth and gums less healthy. And, if you’re facing a restoration like dental implants, smoking can make that process harder or even increase the risk of failure. 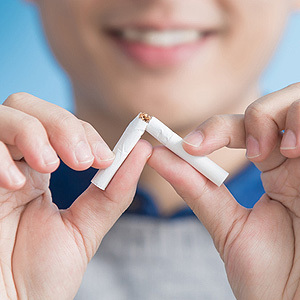 So, to give your willpower some needed pep talk material, here are 3 reasons why smoking doesn’t mix with dental implants. Inhaled smoke damages mouth tissues. Though you may not realize it, the smoke from your cigarette or cigar is hot enough to burn the top layer of skin cells in your mouth, which then thickens them. This could affect your salivary glands causing them to produce less saliva, which in turn could set off a chain of events that increases your risk of tooth decay or periodontal (gum) disease. The end result might be bone loss, which could make installing dental implants difficult if not impossible. Nicotine restricts healthy blood flow. Nicotine, the chemical tobacco users crave, can restrict blood flow in the tiny vessels that course through the mouth membranes and gums. With less blood flow, these tissues may not receive enough antibodies to fight infection and fully facilitate healing, which could interfere with the integration of bone and implants that create their durable hold. Slower healing, as well as the increased chances of infection, could interrupt this integration process. Smoking contributes to other diseases that impact oral health. Smoking’s direct effect on the mouth isn’t the only impact it could have on your oral health. As is well known, tobacco use can increase the risk of systemic conditions like cardiovascular and lung disease, and cancer. These conditions may also trigger inflammation—and a number of studies are showing this triggered inflammatory response could also affect your body’s ability to fight bacterial infections in the mouth. Less healthy teeth, gums and underlying bone work against your chances of long-term success with implants.